When you owe money on some debt, creditors or collection agencies may bombard you with phone calls, letters and possibly emails in an effort to get your attention and get the money they are supposedly owed. While the Fair Debt Collection Practices Act (FDCPA) prevents these creditors from doing anything that would be considered to be harassment, creditors may find ways to hound you that, although not technically against the FDCPA, are still extremely bothersome and stressful. Knowing how to handle creditors and collection agencies when they are contacting you about debt can help you put an end to incessant calls and letters. End the harassing phone calls and mail. Pay down or off some debt. Save your sanity and get a plan in place to lower your debt. In this three-part blog, we will highlight some of the specific ways that you can effectively handle creditors and collection agencies when they come knocking. If you’ve tried the tips discussed herein and are still battling with creditors over debt, it may be time to call Denver Bankruptcy Attorney Arthur Lindquist-Kleissler for some specific info about the best debt relief options for you. 1. Answer the phone – don’t avoid the calls. Although your immediate instinct may be to avoid picking up the telephone when creditors or collection agencies call you, answer the phone and take the call. Avoiding these calls will do nothing to help your situation, and it may, in fact, work against you, as it could make creditors far less likely to want to work with you and possibly drop the payment amount when you eventually decide to confront this situation. Here, it’s important to point out that, by law, you have the right to ask creditors to stop calling you about the debt (and to refer them to your lawyer if you have one representing you). While making such requests will not resolve the underlying debt, it can give you some peace from the incessant calling. 2. Figure out if you actually are responsible for the debt. Don’t assume that, just because creditors are contacting you about a debt, you are actually responsible for paying that debt. It’s quite possible that creditors can get it wrong, there could be mistakes on your credit report and that you end up getting pestered about debt that isn’t even yours in the first place. 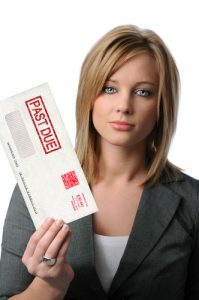 Determine whether you, in fact, are the person responsible for repaying the debt. Make sure that the stated amount of the debt is correct. If the debt isn’t yours or the amount of the debt is wrong, you need to take action to correct these mistakes. Check out the second and third parts of this blog to come for some more tips on how to handle creditors and collection agencies when they are pestering you about paying back debt. Mr. Lindquist-Kleissler is known for providing both individuals and businesses with the highest quality of legal services when it comes to debt relief and bankruptcy, and he can help guide you through bankruptcy so you are able to achieve the best possible outcome to your case. Contact us by calling (303) 691-9774 or by emailing us using the form on this page. You will pay nothing up front to obtain trusted, professional advice regarding your case and your options.